Congestive heart failure is a significant medical problem, and abnormalities in calcium handling leading to a delayed decline in the calcium transient have been identified in failing hearts. Calcium lowering during diastole in cardiac myocytes is markedly influenced by the activity of the calcium ATPase of the sarcoplasmic reticulum which pumps 2 moles of calcium per mole of ATP split from the cytosol into the vesicle of the sarcoplasmic reticulum. In patients with end-stage heart failure, decreases in the level of the SERCA pump have been identified in some reports, however, have not been found by other investigators. To determine if the SERCA2 pump could be overexpressed in the hearts of transgenic mice and what contractile alterations would result, such mice were constructed. No detrimental effects were identified in those animals and a 20% increase in SERCA pump protein lead to an increase in contractile behavior under in vivo conditions and to an accelerated calcium transient and contraction in isolated myocytes under not hemodynamically loaded conditions. Compensatory functions for a hypothyroidism-induced decrease in SERCA pump activity were identified in transgenic SERCA mice. The SERCA2 transgene lead to a functional improvement by compensating for the prolonged relaxation of papillary muscle identified in wild-type hypothyroid mice. Similarly, a compensatory effect could be identified using adenoviral vectors expressing a SERCA transgene upon infection of cardiac myocytes exposed to the phorbol ester PMA which leads to a decrease in endogenous SERCA levels. In addition to improving the calcium transient by increasing the expression of SERCA2 protein levels, diminishing the inhibitory effects of phospholamban should also lead to increased SERCA activity and corresponding improvements in calcium handling and in contractile function. To explore this in further detail a dominant negative mutant of phospholamban was constructed by changing the lysine of position 3 to glutamic acid and the arginine of position 14 to glutamic acid. Adenoviral vectors expressing antisense RNA to phospholamban were also used. Infecting neonatal and adult cardiac myocytes with dominant negative mutants of phospholamban or phospholamban antisense constructs lead to a significant increase in SERCA activity, acceleration of the calcium transient, and increased myo-cyte contractility. 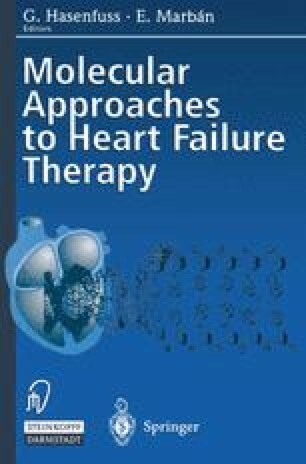 The decreased calcium transient occurring in end-stage congestive heart failure may therefore be improved in the future using viral vector-based increases in SERCA transgene expression or in increasing SERCA activity by using phospholamban mutants or antisense constructs.